Robert Ruhl "Rob" Simmons is a retired U.S. Army Colonel and former U.S. Congressman from Connecticut. 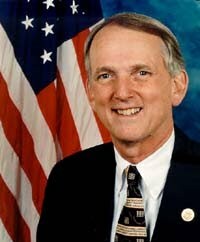 He served as a member of the United States House of Representatives from 2001 to 2007, representing Connecticut's Second Congressional District as a Republican. Simmons unsuccessfully ran as a candidate for the Republican nomination for U.S. Senator from Connecticut in 2010. He currently is Chairman of the Yankee Institute for Public Policy.